Air New Zealand expects all necessary inspections for its Rolls-Royce Trent 1000 engines that power its Boeing 787-9 fleet will be completed within the next 12 months. In the meantime, the airline plans to dry lease three widebody aircraft as cover for grounded 787s awaiting engine checks alongside schedule changes on certain routes in order to offer “better reliability” for passengers, Air New Zealand chief executive Christopher Luxon said during the company’s 2017/18 full year results presentation on Thursday. “We continue to work closely with Rolls-Royce to limit the impact of the global Trent 1000 engine issues but we do recognise that we need to deliver greater schedule certainty for our customers going forward,” Luxon said. Over the recent summer holidays and again earlier in 2018, Air New Zealand wet-leased aircraft as cover for its Boeing 787-9s being grounded due to regulators calling for inspections on the Rolls-Royce Trent 1000 engine. However, as the mandatory engine inspections have taken longer than previously expected to complete, Air New Zealand sought aircraft for dry lease, where they are operated by the airline’s own pilots and cabin crew. In May, Singapore Airlines Boeing 777-200ER 9V-SVL was registered on the New Zealand Civil Aviation register as ZK-OKI. The aircraft, which is configured in a two-class configuration across business and economy, has been scheduled to operate Auckland-Honolulu between July and September and then Auckland-Perth in September and October. 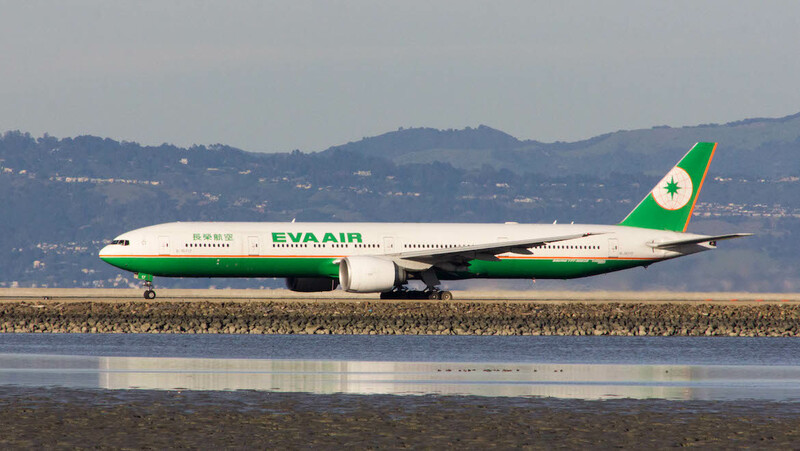 Air New Zealand has also dry leased EVA 777-300ER B-16717 as further cover. The aircraft, which has a business, premium economy and economy cabin, has been registered as ZK-OKT and will operate on the Auckland-Vancouver, and Auckland-Nadi routes over August and September, as well as between Auckland and Honolulu over September-October, according to the airline’s website. The company said in its full year results the three dry lease aircraft would comprise two 777-200s and one 777-300. Meanwhile, schedule changes including retiming flights to Tokyo Haneda and reducing frequencies to Buenos Aires and yet-to-commence flights to Taipei. This would be the equivalent of freeing up two widebody aircraft in order to allow for a bit more schedule certainty for passengers. Regulators have called for more regular checks on Rolls-Royce Trent 1000 engines’ intermediate pressure compressor rotor blades. de to some durability issues. Rolls-Royce said earlier in August the peak number of aircraft on ground reached about 50 earlier in 2018 and was gradually being reduced as the company ramped up its maintenance, repair and overhaul (MRO) capacity to cope with the increased inspections. “We have the situation with each customer’s engines plotted out over the next 12 to 18 months and that is a dynamic situation but we are working very closely with them on that,” Rolls-Royce chief executive Warren East East said during Rolls-Royce’s first half results presentation on August 2. Luxon said the inspections were taking longer than initially expected. “We were recently notified that there is likely to be a delay in getting some of our engines back,” Luxon said. “Just to be clear, the delay is not in relation to any new technical issues. Rather it is because the timing of the engine maintenance program has shifted. The Air New Zealand chief executive described the situation as a “global production and parts backlog”. “Obviously this is an issue affecting a global fleet and as Rolls-Royce deal with that through their production facilities they have got a throughput issue and a challenge,” Luxon said. In other Air New Zealand fleet news, the airline said it had signed a commitment with Airbus for seven A321neos for its domestic operations. The commitment was separate to the existing order for 13 Airbus narrowbodies, comprising seven A321neos and six A320neos that will begin to arrive in the coming months and be deployed on trans-Tasman and Pacific Islands routes. The use of the larger A321neo on its domestic network was raised as a possibility at the airline’s investor day in June. 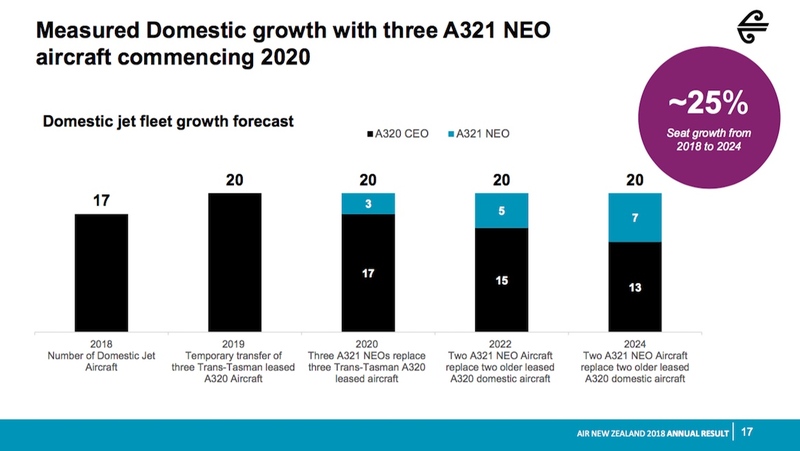 Air New Zealand chief financial officer Jeff McDowall said the domestic A321neos would offer efficient growth through upgauging and deliver cost efficiencies. “We’ve been growing our domestic business very strongly over the past five years,” Air New Zealand chief financial officer Jeff McDowall said. As far as the bottom line for the previous financial year was concerned, Air New Zealand posted net profit of NZ$390 million for the 12 months to June 30 2018, up 2.1 per cent from NZ$382 million from the prior corresponding period. 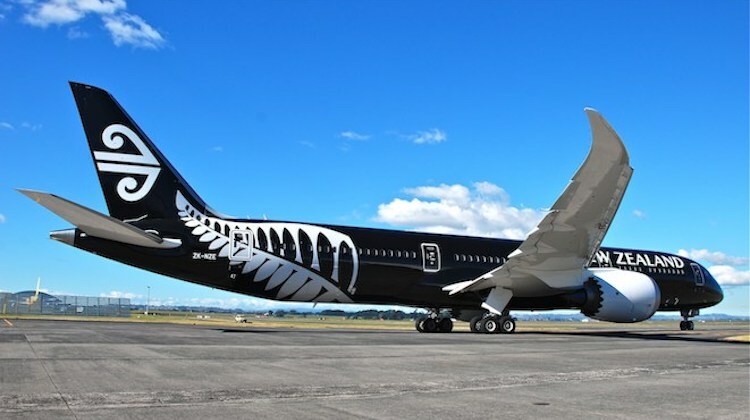 In recent years, Air New Zealand has been in expansion mode, with long-haul services to the Americas and Asia such as Buenos Aires, Houston and Singapore launched as the airline sought to take advantage of strong growth in visitor numbers to New Zealand. There has also been capacity growth in its home market as it upgauged regional routes from 19-seat Beechcraft turboprops to 50-seat Q300s or 68-seat ATR 72s. There has also been more jet services added on main trunk routes. And there is more to come, with new services to Chicago and Taipei due to commence in November. Closer to home, Air New Zealand is also ramping up capacity on trans-Tasman routes from the end of October, when its alliance with Virgin Australia ends. The slender improvement in full year profit was achieved amid a 25 per cent increase in oil prices, which lifted Air New Zealand’s total fuel bill for 2017/18 to NZ$160 million, or 19 per cent. Meanwhile, earnings before taxation, which the company regarded as the best indication of financial performance, rose 2.5 per cent to NZ$540 million, compared with NZ$527 million a year ago. “This is an impressive financial result, driven by strong revenue growth across the airline’s key markets, as well as continued focus on sustainable cost improvement, despite significantly higher fuel prices,” Air New Zealand chairman Tony Carter said in a statement. Looking ahead, Air New Zealand has guided the market to expect underlying earnings before taxation in the range of NZ$425 million to NZ$525 million for 2018/19. The forecast did not include the estimated $30 million to $40 million impact from the Rolls-Royce Trent 1000 engine issues that have impacted the 787-9 fleet. Air New Zealand said the engine troubles on its 787-9 fleet did not have a material impact on its 2017/18 earnings. Air New Zealand’s capacity guidance showed available seat kilometres (ASK) was expected to grow between four and six per cent in the current year. The airline planned to increase capacity in the domestic market between three and five per cent as it added extra jet flights to Dunedin and Queenstown, and expanded in some regional ports. Its Tasman and Pacific Islands network was forecast to expand by seven to nine per cent, which accounted for the new flying schedule to Australia and the introduction of the Airbus A321neo into those markets. 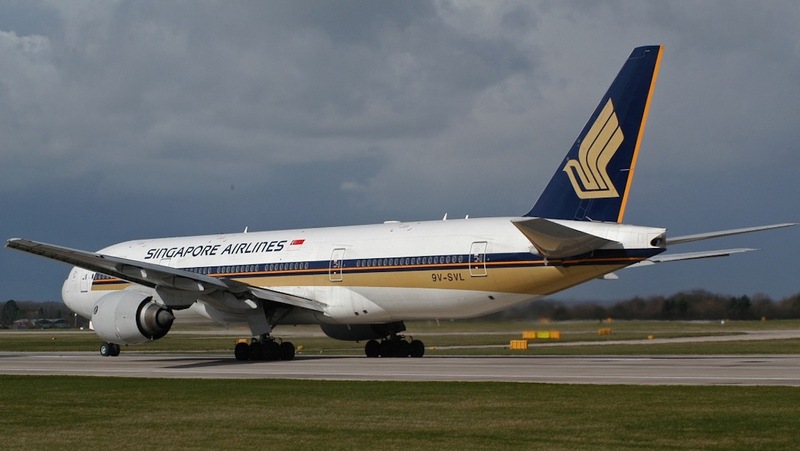 And international long haul ASKs were expected to grow between three to five per cent as it started flights to Chicago and Taipei, as well as increased flying to Singapore. “As we look forward we continue to see good demand across our key markets,” Luxon said. The company declared a final dividend of 11 cents per share.